As we hit the potential half way point of Fairy Tail’s Final Season, I think I’m starting to understand what’s going on here. More so than any other episode, I think this week’s offering laid it all quite bare for everyone to see. 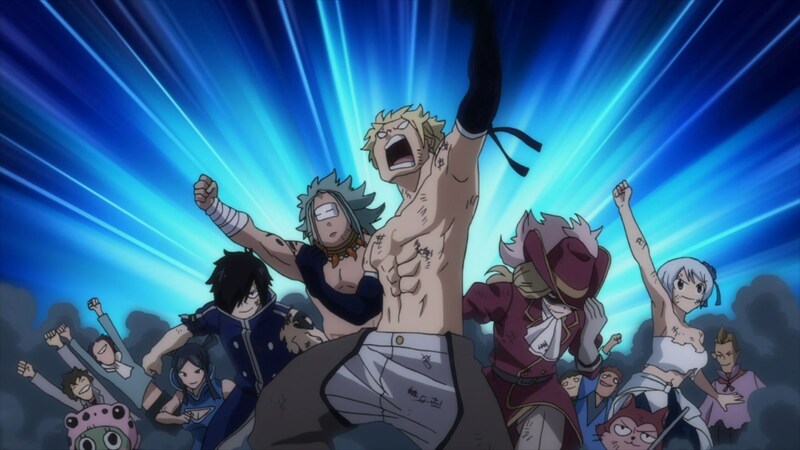 Simply put, Fairy Tail’s Final Season doesn’t have the budget or funding to be able to properly adapt and animate the story that its trying to. So instead, the show and its producers are trying to employ every technique in the book to save costs, and only use money where it is really needed. That basically explains all that static shots and the over emphasis on comedy. Most of the episode actually is those two things, things that are simple to animate and which don’t require a huge amount of budget or talent to animate. And look, I don’t envy the people behind this Final Season. They have to cap off a popular shounen franchise with a budget that’s clearly a lot less than the first or even second series. Unfortunately the creativity that they’ve employed to make everything work is actively ruining the story as a whole. This emphasis on dumb comedy segments, the lack of focus or skill on display with repeated freeze frame shots and the juggling of multiple story lines in an effort to provide as little from each as possible is a combination that’s actively destroying any impact or emotion from this big moments. 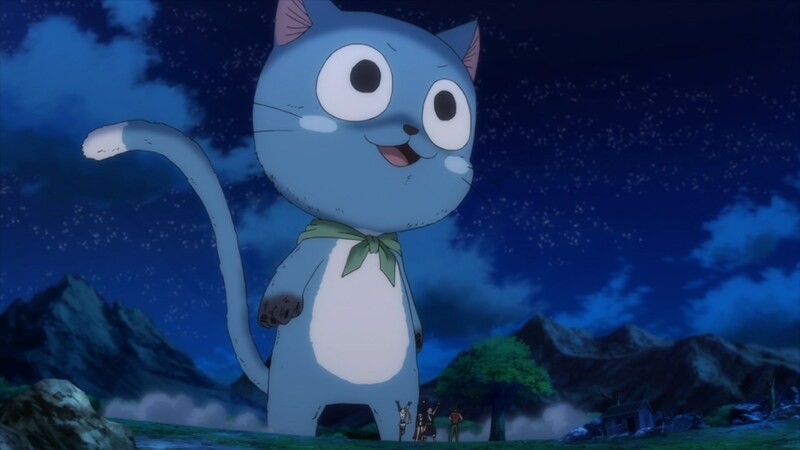 Part of me wonders if Fairy Tail’s Final Season actually needed 50 episodes, and perhaps a shorter, more refined version of 25-30 episodes would’ve sufficed. I say that, because if you cut out the fluff from all the past episodes, and focus each episode on one event, then we’d be a lot further into the story AND would have had better animated fights as a whole. Taking this week as an example, almost nothing happens on multiple fronts except for one. Natsu and his group end up meeting August, but that’s about it. Irene prepares for Acnologia, but all we get is a bunch of monologing and some quick banter between her and her two assistants. And lets not even touch the Mavis/Cana scene, which had no reason to be there at all. Cana and Mavis can deal with their issues off screen, and it would be better to just cut to them when something actually happens. The only real thing that matters, is Gajeel’s fight with Bloodman, but even that is neutered by unnecessary scenes from both Sabertooth and the new Oracion Seis. I get that Sabertooth has to revive and join the battle, but a long drawn out segment about them and their “cry baby” master was a bit too much. It would be one thing if Sting or any of his other friends were actually going to play a part in the battle, but since they’re just off dealing with fodder on the side, it’s just kind of pointless. 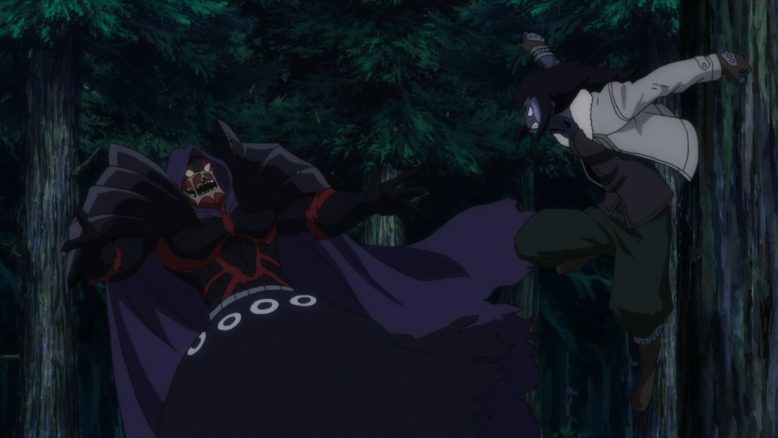 Again, the only reason we get all this fluff stuff is because the anime probably can’t afford to focus on and animate the Gajeel vs Bloodman fight. What we do get is halfway decent, but you can just see the budget for the show crack under the pressure of what it has to animate here. There’s a lot of recycled stuff used from previous seasons, and all in all, the fight as a whole feels a bit underwhelming except for a few shots. 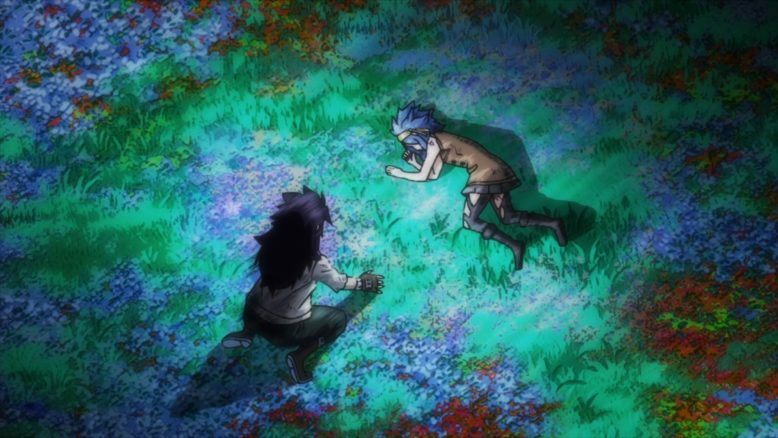 And Look, what we get with regards to Gajeel is cool, combined with the twist at the end where Levy basically sacrifices herself to try and help Gajeel. Its a cool moment, and its setting up for what I think will be one of the arc and the story’s big tragic moments. What is a shame, however, is that it was the preview, not the episode, that got me feeling something this week. 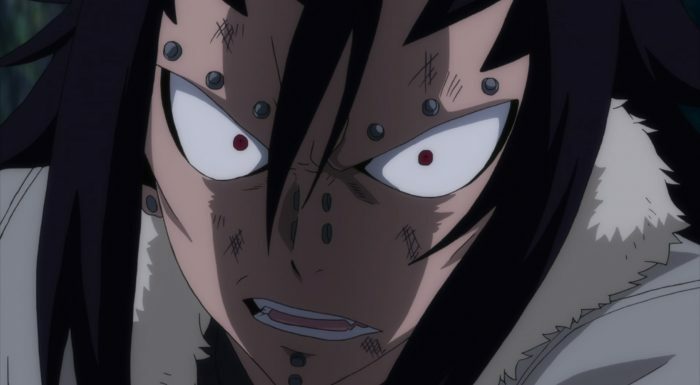 I normally don’t talk about previews anymore ( because they basically invite spoiler talk), but I have to say, the little description of what Gajeel wants, combined with those shots of him and Levy? Man, that was powerful stuff. Why that powerful stuff is focused on and featured more prominently? I think we all know by now. I’m mulling over the question of whether it would’ve been better to get this season like this or not at all, and I’m still not sure. So far its clear that Mashima-sensei forced this adaptation through because he had promised fans, and it doesn’t seem like there was a huge amount of business or commercial interest here. It makes sense, since Fairy Tail as a franchise is kind of cooled down now. We’ve got some spinoffs and that sequel 100 year quest thing going on, but the main manga is done. Had the show started and been planned to end at the same time as the manga, things would’ve been different. As it stands, I guess anime only viewers are getting shafted, like they generally are. Its an odd place for me to be at, mostly because I own most of the manga that’s been released in the west, but held off reading it because I wanted to enjoy the anime. From the way things are going, I suppose that was a bad decision. Maybe I should’ve read ahead and just compared the anime to the manga. I’m still not sure if that’s a direction I may still go in. Half the story is still left, and it might just be better to experience that in its raw, unfiltered manga form rather than get what we’re getting here. Its a sad day for anime only fans of Fairy Tail, which number in the very few I suppose. Maybe next week, and Gajeel’s big moment for this arc, will be better.